Horace Langford Jr. / Pahrump Valley Times MMA fighter Brandon Schneider trains with coach Brian Thelaner. The fighter returns to the ring in two weeks in Mesquite. The fighter is battling a longtime drug addiction in addition to what he faces in the ring. 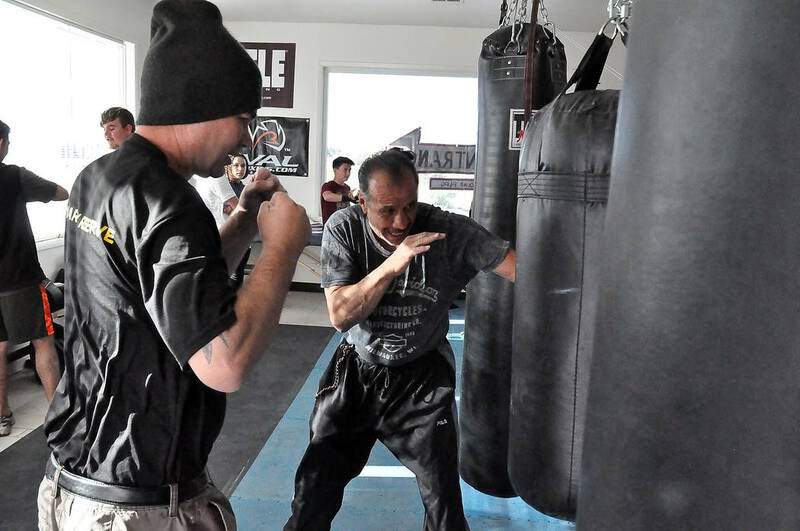 Horace Langford Jr./Pahrump Valley Times Boxing coach Ruben Bajo (on right), instructing class on hitting the bag. Bajo believes Mayweather should win the fight with his skill set. Horace Langford Jr./Pahrump Valley Times Boxing academy coach Rodney Crisler with (L-R) Ivan Crisler, Michael Luna and Matthew Reynolds. Horace Langford Jr. / Pahrump Valley Times - Above: MMA Fighter Brandon Schneider sparring with coach Brian Thelaner (right). Thelaner coaches jiu-Jitsu and kickboxing. The Conor McGregor vs. Floyd Mayweather fight is scheduled for Las Vegas at the T-Mobile Arena on August 26 and the seats are already sold out. The fight will be a big deal and who will win is something that the experts really can’t nail down. Who will win? Last week mixed martial arts fighter and local karate expert Andrew Gonzalez spoke out about the Conor McGregor vs. Floyd Mayweather fight and said “that hands down the best boxer in the sport,” Mayweather will win the fight. This week two boxing coaches from Pahrump speak out, along with one MMA coach on the fight. 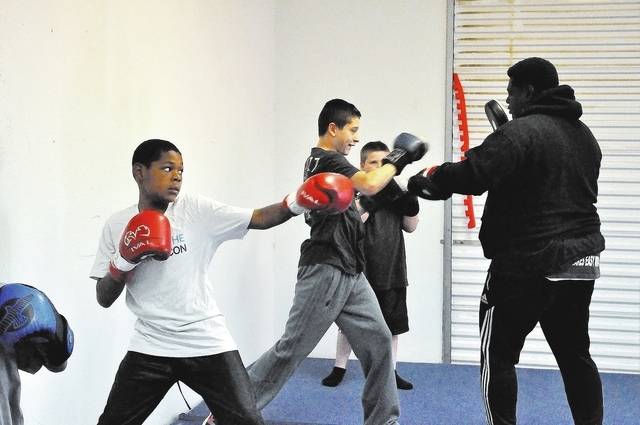 Boxing coach Rodney Crisler began teaching a beginning boxing class for ages four to 15 about a year ago. He is currently teaching eight-to-10-year-old kids in Pahrump at the VIP All-Stars gym at 2400 East Basin Ave. He said he also teaches adults. Crisler, surprisingly, is not saying that Mayweather will win. Boxing coach Ruben Bajo has been boxing since he was five years old. He also coaches boxing in Pahrump. He teaches at his church near Home Depot. Bajo is backing Mayweather. Bajos says the training that Mayweather does is far different than the McGegor. He said McGregor will lose for several reasons. “Boxing conditioning is better than the MMA. There is no comparison. It is fives times more than what an MMA fighter does. There is also the glove factor. Boxing gloves are heavier than what MMA fighters use. I see the gloves will take a toll on McGregor. After a few rounds he will drop his hands and Mayweather will take him apart,” he said. He also says that McGregor will not have the gas to go the full distance. MMA coach, Brian Thelaner believes Mayweather will win this fight hands down. 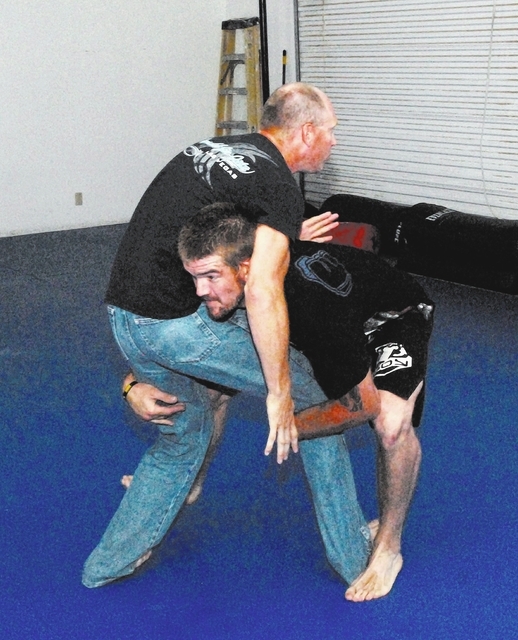 Thelaner is a jiu-jitsu and kickboxing coach and has been a personal coach for amateur MMA fighter Brandon Schneider. As far as McGregor having the gas to go the distance, he doesn’t agree with Bajo.